We are happy to introduce our first ever, MEMBERS-ONLY, education "bundle" pricing. As the quality of our events grows, what's not growing for many of you is your budget, which puts a crimp on your ability to invest in your professional and personal development. We now have a solution! Instead of registering for each event separately, purchase a "bundle," and gain access while you SAVE. Not a member, JOIN NOW! Plan your professional development for the year! AFP Chicago is dedicated to the professional development of our members. We offer high-quality programming to help guide you in your career. Professional development is more than a requirement - it's a way to grow in your fundraising profession. Savings - Buy a Bundle! Save a Bundle! Choose from the topics that interest you most! Life is unpredictable, and unexpected changes will inevitably occur. When purchasing a bundle and your plans change, you are allowed one substitution or registration transfer to another member. Review the frequently asked questions page for more information about AFP Chicago's Education bundle pricing. Read about program details and cancellation policies. I am not a current member of AFP Chicago. Can I become a member later and take advantage of this offer? 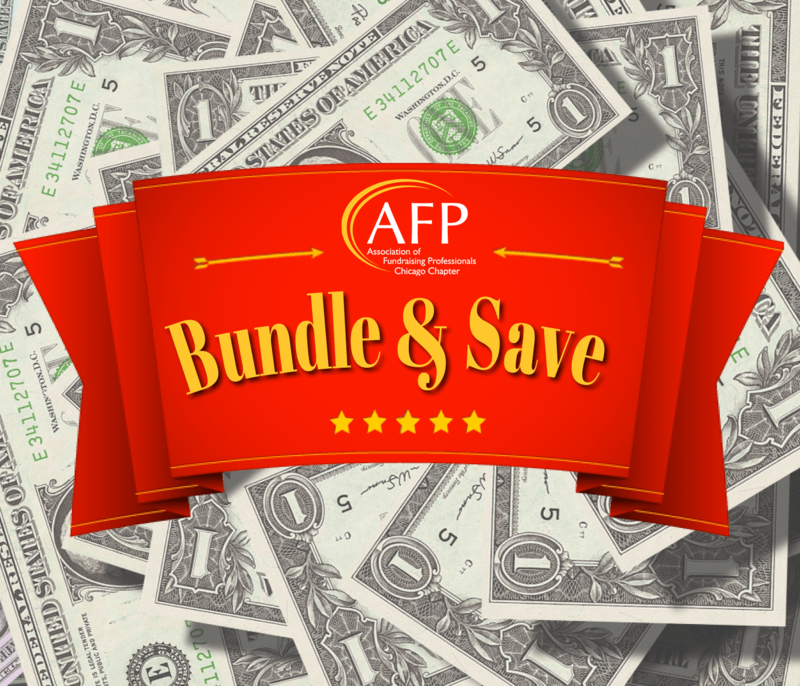 You must be a current member of AFP Chicago to bundle and save. No cost adjustments will be made if you register then become a member at a later date. Can I receive a refund if I am not able to attend the program(s)? To receive a refund on program bundles, you must email your withdrawal request to [email protected] at least three (3) business days before the program. Any program(s) already attended will not be refunded and will be treated as an individual purchase(s). A $10.00 processing fee will be applied. Can I send someone in my place if I cannot attend a program? The bundle offer belongs to the member that purchased it. We will accommodate one substitution. Can I transfer a registration to another program? We will accommodate one program transfer to another AFP Chicago Member. Participants who transfer to a later breakfast program will then not be eligible for a bundle refund.